Doré, Yvon. "Caroline Brunet". The Canadian Encyclopedia, 26 July 2015, Historica Canada. https://www.thecanadianencyclopedia.ca/en/article/caroline-brunet. Accessed 25 April 2019. 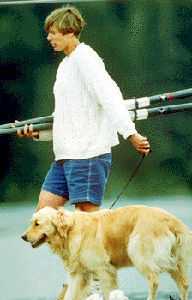 Caroline Brunet, kayaker (b at Québec City 20 Mar 1969). She was interested in KAYAKING since the age of 11, and rapidly demonstrated the exceptional qualities that would lead to world-class fame in her discipline. Caroline Brunet, kayaker (b at Québec City 20 Mar 1969). She was interested in KAYAKING since the age of 11, and rapidly demonstrated the exceptional qualities that would lead to world-class fame in her discipline. Since 1988, when she was only 19, Caroline Brunet has been a member of the Canadian kayaking team. She acknowledges that her first trainer, Denis Barré, greatly influenced her career development. On the Canadian scene, she won the first of her many national titles in K-1 500 metres in 1988, a month before her first OLYMPIC participation at Seoul. At the world championships, her first medal dates back to 1993, the bronze in K-1 500 metres, an event that would bring her much success. The list of her championship medals since 1993 speak for themselves: 8 gold, 4 silver, and 3 bronze, making her the uncontested leader in the history of Canadian kayaking. On the Olympic scene, her efforts were also greatly rewarded in 1996 in Atlanta, after her honours placement in 1992 in Barcelona. During her 3rd participation in the Olympic games, she reached the 2nd step of the podium in K-1 500 metres. Caroline Brunet was the only Canadian medalist at Atlanta in canoe-kayaking, and the first since 1984 - the successful result of rigorous training for 5 hours a day, 11 months of the year.